A fairly common problem area for homeowners association communities is the use of lawn signs by residents, especially during election season. When HOAs attempt to crack down on the use of signs in accordance with their governing documents, they sometimes become the subject of unfavorable media attention. Such was the case recently in St. Cloud, Fla. near Orlando when an HOA’s battle with some of its homeowners over a yard sign supporting law enforcement became one of the lead stories by the local Fox Network television affiliate for Central Florida. 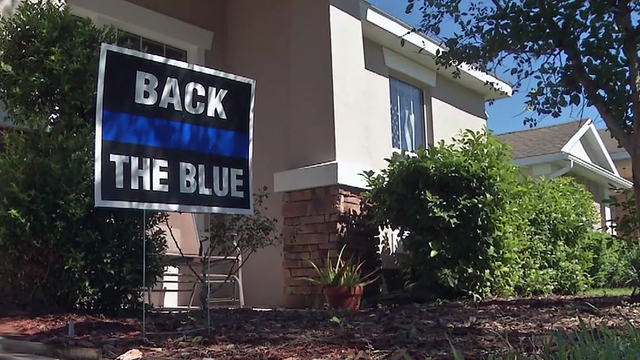 According to the report, the Burgess family’s “Back the Blue” yard sign supporting the police in the wake of two Kissimmee officers being shot and killed in the line of duty became the subject of a major brouhaha with their association. Dozens of other residents began supporting them and displaying the same sign, which their association said had to go. The association in this case and others like it in similar straits would be well advised to work closely with highly qualified and experienced legal counsel in order to negotiate and find an equitable solution for both sides in disputes involving yard signs. They should apply a common sense approach, which should being by explaining to the homeowners displaying the signs that the association’s rules must be fairly and uniformly applied in order for them to be effective in maintaining the property values for all of the community’s owners. That being said, associations should then be open to finding a middle ground that would appease both sides. For the association in the recent TV news report, perhaps limiting the size of the signs, the timeframe during which they may be displayed in the aftermath of incidents involving law enforcement, and their placement near the front porches of the homes could enable the board to enact a rule conceding some limited use of this and other similar signs. This same approach also works for political signs during election season, and it is the type of compromise that can enable associations to avoid confrontations while still maintaining an adequate level of control over the use of signs in accordance with their rules.